It's never quite as fun if you can't recognize the places. I've never heard of Moomin's before but I hope you enjoy the theme park regardless!!! How had you missed watching Sound of Music? It's so funny how different our lives can be, I've seen that movie sooo many times..mostly when I was a little girl! I've never heard of Moomin, but he sounds like great fun. I've never seen The Sound of Music either. 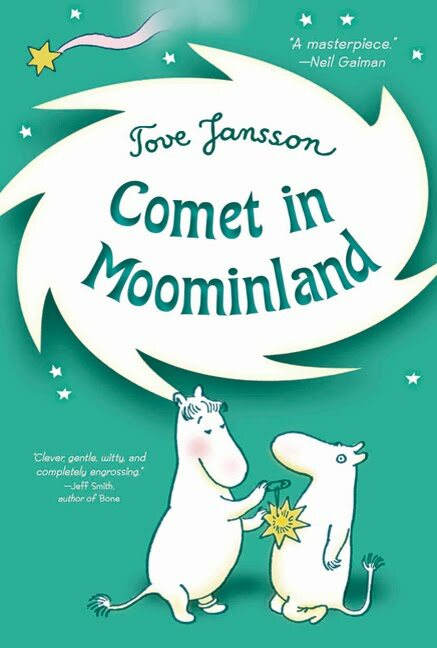 I had never heard of Moomin, but the cover alone makes me curious to see what it's like. And of course, Neil Gaiman saying it's "a masterpiece" helps. Yeah, Neil Gaiman has great taste! The Sound of Music was a Christmas tradition in my house. This sounds fun - I enjoy absurd things. Read Moominland Midwinter next please, Lenore! It is made of awesome! Silly in the best possible way sounds great to me. I have one of the Moomin collections in my tbr pile and really ought to read it one of these days. Life isn't worth living without watching The Sound of Music. That and Gone with the Wind! Anyway, this book looks adorable and quirky. I want those characters as pets. Thanks for sharing Moomin! I hope you enjoy this theme park! You'll have to post about it when you do, I'd love to see what kind of amusements they have surrounding the Moomins! You know, I've never read a Moomin book, but I have heard so, so much about them, and apparently they are staples of childhood for some. I am glad you liked the book, and after reading your review, I think I may have to try one of these books. They look like a lot of fun!! I hope you have fun at the Moomin theme park! I'll be interested in hearing how that goes!! I've heard of Moomins, but I didn't know they had books! It looks adorable. There's a Moomin-land? That's hilarious, I had no idea! I tried to read the books to my oldest son when he was little, but they just didn't grab us at the time. I'll be sure to read them if we ever travel to Finland. I've only read one of Tove Jansson's books about Moomin, not to crazy about it. But I might have had an overdose of Moomin cartoons from my childhood :) Might give them another chance though. They look so cute! I really want to read one of these books now!! I have a blogger friend (ReadersGuide) who loves the Moomins, so I told her it was Moomin week at Tor and credit you for alerting us to it! Haha, you are going to the theme park? I love it, I went there many times when I was younger. In Finland kids grow up watching moomies (it is this animation made by japanese people but it is based to the stories in Tove Jansson's books) and by hearing stories about moomies etc. Moomies has become a big thing in Finland since it is pretty good advertisement to other countries. You can buy all these moomie things from the airport etc. But I hope you enjoy the park if you are going there. It is awesome! And the other moomin books are amazing as well, for example moominland at winter or something like that, I don't remember the exact name.